The only thing worse than catching a movie in the middle is discovering it is so wonderful, you yearn to see it from the beginning . . . only you have no clue when it will be playing again. This is what it’s like to read Toxic by Jus Accardo. 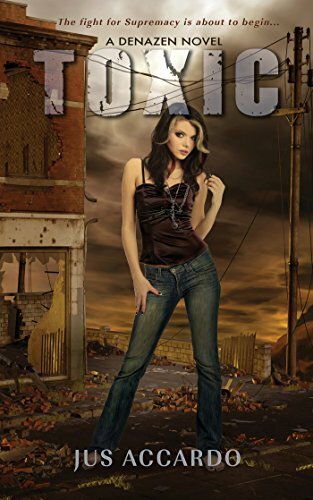 Toxic is a paranormal teen romance about Dez, a hottie with the ability to mimic cool things, like clothing, hairdos, and accessories. Dez loves Kale, a hunk with a toxic touch, ergo, whatever he touches with his bare fingers incinerates into a cloud of powdery ash. Dez and Kale are wild for each other and have the perfect boyfriend-girlfriend relationship except for one thing. Well, actually, two: First, Dez can’t touch Kale without immolating into a pouf of ashes, so she has to keep her hands to herself. Second, Dez’s evil father (who works for an evil place called Denazen) is trying to capture Dez and Kale and return them to Denazen so he can continue experimenting on them. Dez and Kale are “Sixes,” which means they are kids with special powers. They are surrounded by a host of other well rounded and believable characters who are Sixes with extraordinary abilities and secret agendas. For example, Jade, a beautiful Six who feels no pain and can’t be destroyed, is recruited to help Kale learn to control his toxic touch. Jade thinks Kale is a hottie so she doesn’t hesitate to touch him all over, and she also doesn’t hesitate to flaunt her ability to touch him in Dez’s face, providing plenty of fodder for jealousy and rivalry. There are other mysterious characters: a grandmotherly woman who can take down an entire army with one hand tied behind her back, and a girl who can make herself and whomever she touches invisible—a handy trick when Dez wants to spy on Jade and Kale without being seen. As a writer, Ms. Accardo demonstrates an exceptional ability to make readers “see” everything that is happening. Her prose is fast paced, her detail is meticulous, her characters are believable, and her storyline is packed with tension and sprinkled with humor. But . . . Toxic is still one frustrating book. Why? Because Toxic is actually the second book in a trilogy about a place called Denazen that experiments on certain human beings called “Supremacy.” There seems to be a foregone conclusion that readers will have read the first book in the trilogy—Touched—so Toxic does not elaborate on crucial specifics, such as what makes a Six a Six; whether “Supremacy” kids mutated into what they are or whether they were invented; why Denazen wants to use Sixes as weapons; who Denazen will fight with these weapons; and . . . well, the list goes on and on. If the reader has not read the first book, he or she won’t have a clue what is going on, and will likely to be swallowed up by that “lost-in-the-woods” feeling throughout the entire book. Of course, one remedy is simply to read the first book in the trilogy. Unfortunately, the prequel is no short read. Like Toxic, it has 400 long pages, quite a distance to have to go back for a few crucial details that could, with a bit of fancy wrangling, have been covered effectively in this book.